Nice pic MW! I bet she and Philip were joking about the rumors of her and Charles being engaged all those years ago. Here's some stuff about Prince Robert of Luxembourg. He's the son of Prince Charles of Luxembourg, brother of former GD Jean. Robert's mother was the first commoner to marry into the family and the first American. He is married to Julie, Princess of Nassau, who's also an American. I think several years ago GD Henri upgraded Julie and her and Robert's kids from Count(esse)s to HRH Prince(sse)s. Robert oversees Chateau Haut-Brion and Chateau La Mission Haut-Brion and successfully produces a wine line. Jennifer Aniston: Dinner Party with Prince Robert! Princess Elisabeth (* 1922), married to Herzog Franz Ferdinand von Hohenberg. Third child of GD Charlotte. Margaretha, Marie Astrid and her husband Carl Christian of Austria attended the memorial mass for deceased members of the Belgian royals at the Notre-Dame of Laeken church on February 16th. Margaretha is said to be very close to Fabiola. Her stillborn son Leopold is laid to rest in the royal crypt in Laeken. I do too. She's obviously surrounded by loving family who care about her, but every time I see her out and hunched over like that, it just makes me sad. The fact that she's dressed in a very odd collection of items of clothing doesn't help. Margaretha is said to be very close to Fabiola. Her stillborn son Leopold is laid to rest in the royal crypt in Laeken. Leopold wasn't stillborn, he was born prematurely and died shortly after his birth (the same day he was born). After his death Margaretha and her husband grew very close to Fabiola and Baudouin, especially Margaretha and Fabiola as they shared a similar fate. According to RF Princess Marie Gabrielle of Nassau, born 1986,daughter of Prince Jean and therefore first cousin of the Corns is engaged to marry Antonius Willms, born 1988. Antonius' Mother is born Countess of Goess and first cousin of Moritz of Goess who is the husband of Duchess Fleur of Wuerttemberg. Both M-G and A attended the Ligne/Dampierre wedding together last Summer. 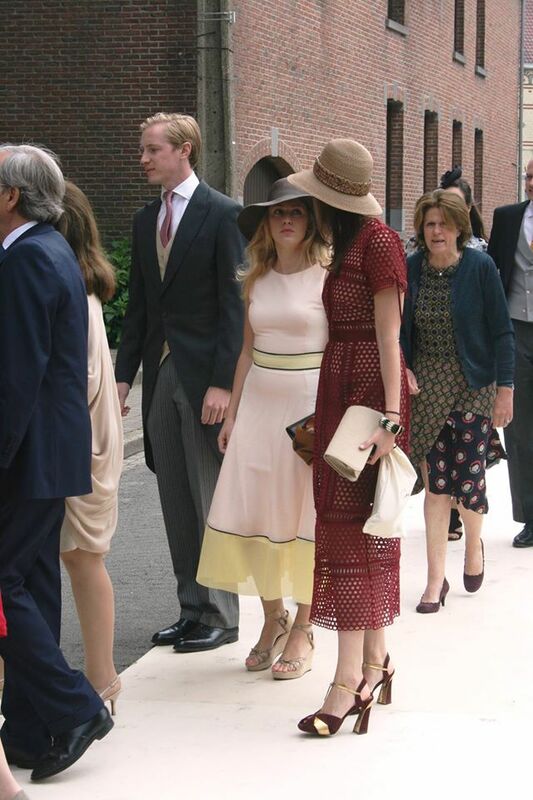 There is a photo on Luxarrazi of them both together with M-Astrid of Liechtenstein at the wedding. They live in Munich but plan to marry in Spain. In contrast to Imre Antonius looks quite attractive IMO. According to RF M-Gabrielle and Antonius will marry civily in Luxemburg on April 1st. The religious wedding will take place in Malaga/Spain in autumn.